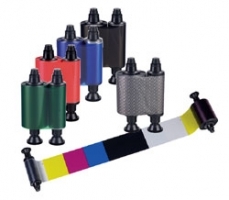 Evolis ink ribbons help you to optimise performance of Evolis card printers. Retail EPoS Systems offers a large range of original colour and monochrome ribbons from Evolis. Of course, we also have special ribbons with colours like gold and silver, scratch-off surface or wax ribbons for lamination in stock. These ink ribbons cover the cards with a protective layer that guarantees optimum card quality even with frequently used cards. Printed cards have a life of up to three years. The printer model Securion covers the cards with a protective film or a polyester coating that extends the cards life to up to 10 years. Contact your personal Retail EPoS Systems representative in our sales department for more information.